I have only had kale a few times, so when I saw a huge bag of it on last week's trip to Wegmans, I threw it in my cart. Last week I saw a pasta recipe using kale, so I pulled it up on my phone and bought the rest of the ingredients - hot Italian sausage, rigatoni, and ricotta salata. My favorite thing about kale, besides the flavor and health benefits, is that it doesn't cook down like other greens such as spinach or arugula. It's a hearty green, has great texture, and a huge bag gives you a LOT whereas a small bag of spinach might be enough for 2 people. I love simple dishes that are packed with flavor, and this one was exactly that. The list of ingredients is very short, it cooks in 30 minutes, it comes together in one pot, and you may say "mmmmm...." with every bite, like I did! My husband kept looking at me with a look that said "I get it - you like it." 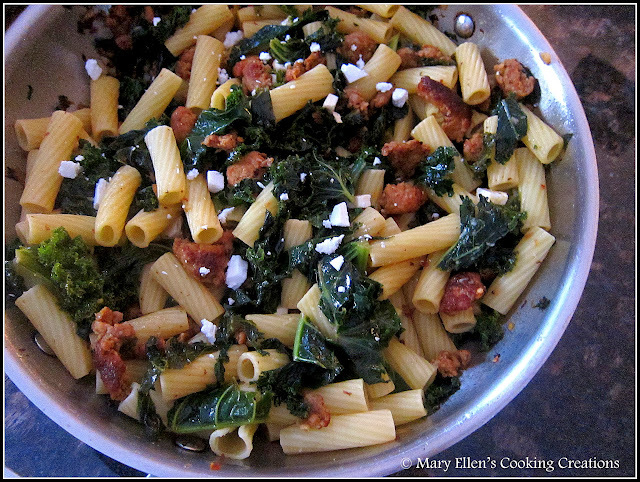 I was SO glad I had leftovers to have for lunch the next day, and I'll definitely be making this again soon. I made 2 minor changes to the recipe - I used low sodium chicken broth instead of water and did not add salt. There is enough flavor from the sausage, and the cheese and broth add the saltiness. 1/2 bag of kale (or 1 large bunch). I prefer the bags because the kale is triple washed and already chopped. Cut a line down the center of each sausage link and remove the casing. Crumble the sausage into the pan, further crumbling it with a wooden spoon or spatula. Cook until browned on the outside, about 5 minutes. 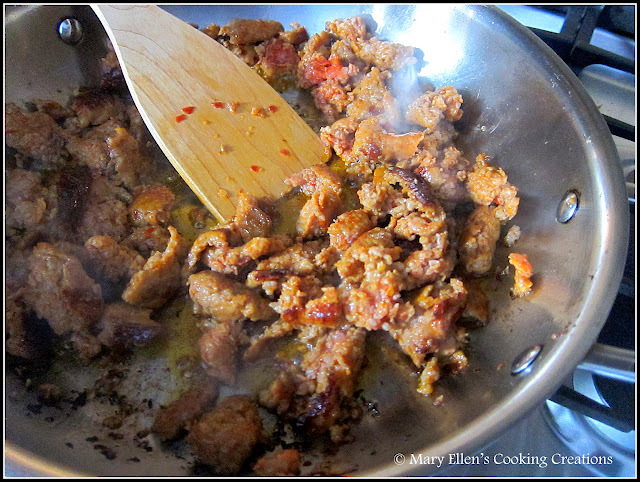 Push sausage to the sides of the pan, add the rest of the olive oil, and then add your onions and garlic; sauté 3 minutes. 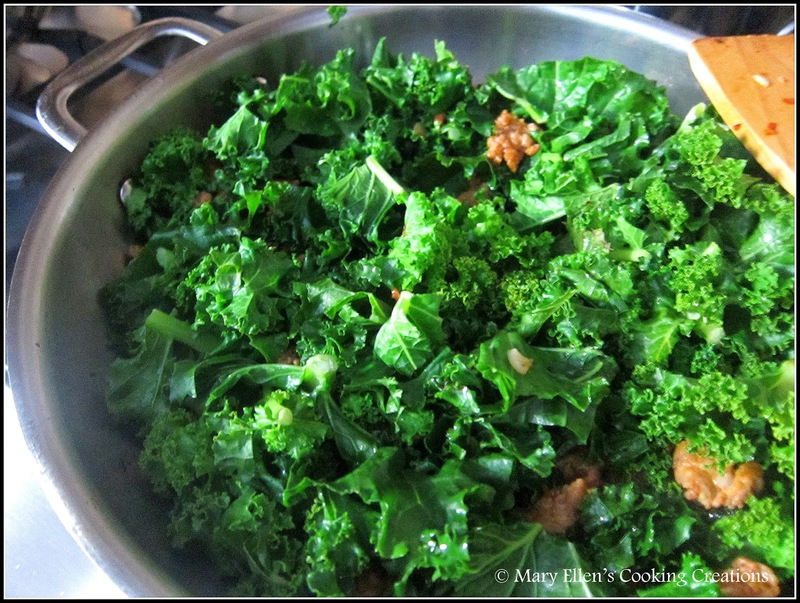 Turn the heat down to low, add the kale, cover and let cook for 20 minutes, stirring every 5 minutes. In the meantime, bring a pot of water to a boil and cook the pasta. After the kale has cooked for 20 minutes, add the chicken broth and the cooked pasta. Stir. Add the Parmesan cheese and top with the ricotta salata. Serve immediately.